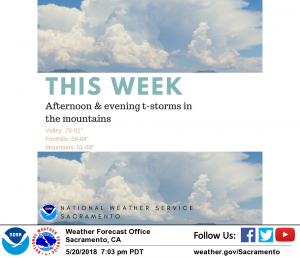 May 21, 2018 – Afternoon and evening thunderstorms possible over higher terrain much of this week. Seasonal temperatures continue across the region. Clear to partly cloudy skies across the region early this morning. Radar showing some light showers across the higher elevations of the northern Sierra south of Tahoe. Onshore pressure gradients have relaxed compared to 24 hours ago and winds at Travis have also decreased, so not looking favorable for a stratus intrusion into the Sacramento region this morning. Current temperatures range from the mid 30s to mid 40s in the mountain valleys to the 50s to lower 60s elsewhere. Satellite imagery shows the latest low closing off to our south over central California while a strong vort presently over NW California is dropping southward. A few light showers may drift down into the Motherlode and northern San Joaquin Valley this morning as vertical motion increases across the southeast portion of the CWA and forecast soundings show rapid moistening. This area will also see potential for some showers late this afternoon and evening as decaying activity from the Sierra drifts southwestward toward the San Joaquin Valley. Closed low forecast to slowly lift northward through the Great Basin Tuesday and Wednesday as the next upstream low approaches NorCal from the west. Shower and thunderstorm activity expected to be mainly diurnal and limited to higher terrain. Next system forecast to bring an upswing in shower activity later Thursday as it approaches the coast near the Bay Area. Guidance shows an upper level low off the CA coast approaching interior NorCal late this week. The upper low will push inland on Saturday. 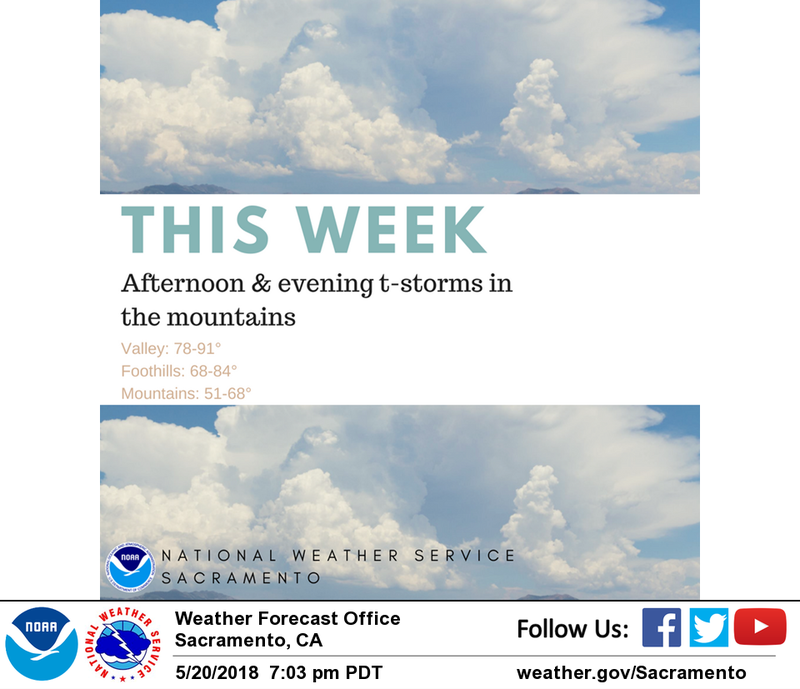 Forecast models indicate enough instability for a threat of showers and afternoon/evening thunderstorms over higher terrain, and possibly in the Northern Sacramento Valley. Drier conditions expected early next week as upper level system moves into the Great Basin. Daytime highs expected to remain near seasonal normals through the forecast period with Valley temperatures in the upper 70s to mid 80s, and 60s to 70s over the foothills and mountains.